The Phresh HyperFan features Laminar Flow Fan Blade & Stator Technology creating optimal airflow similar in technology to an airplane propeller. The result is very high CFMs ( Cubic Feet per Minute ) and exceptional static pressure performance. Phresh HyperFans deliver the highest CFM’s per watt of any fan in the industry. State-of-the-art digitally controlled DC powered Electronically Commutated Motor (ECM) is extremely quiet, long lasting and very reliable. Best of all, this unique technology uses about half the power of traditional fans. The included speed controller can adjust fan speed from 30% to 100%. It is detachable from the fan and independent from the power cord. Lightweight aluminum housing is one-third the weight of comparable steel bodied fans. 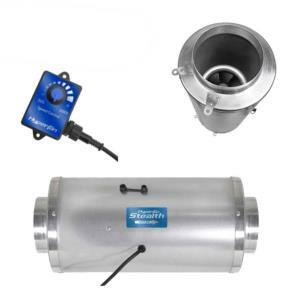 Combining the original hyper fan with the silencing canister technology you get the Phresh HyperFan Stealth series this results in a reduction of 15 dba's perceived to the human ear as 75% quieter perfect for your grow rooms and grow tents. Like the original hyper fan this uses 50% less power than traditional fans. 1206m3/hr - 8 inch version. Compact and easy to install, with universal mounting positions. Can be mounted in any position allowing maximum flexibility during installation. Heavy-duty 6/8/10 mm bearings, versus commonly used 4 mm bearings, ensure smoother operation and increased longevity of the fan. Cord to fan speed controller is 16 ft long.